Bus from Johor Bahru to Genting Highlands is one of the favourite routes for local Malaysians because of the family-oriented integrated resort with theme park and casino in Genting Highlands. Besides that, cooling weather is also one of the attractions for the crowd in Johor Bahru to take bus from Johor Bahru to Genting Highlands. Bus from Johor Bahru to Genting Highlands is the only direct transportation with at least 1 washroom break along the journey. The whole journey takes about 4.5 to 5 hours depending on traffic condition. KKKL, 707, and JB Transliner are the companies providing the bus from Johor Bahru to Genting Highlands. JB Transliner is a bus express agent who helps manage coach fleets from bus operators. 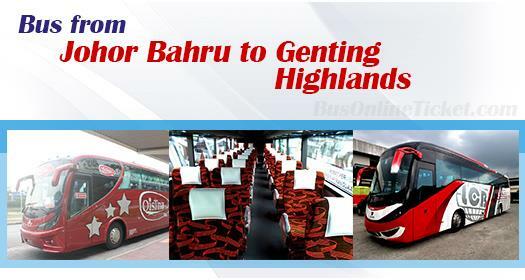 The bus fare for bus from Johor Bahru to Genting Highlands is from RM 55.00 to RM 63.00. Various departure points are provided by the three companies from bus terminals like Larkin Bus Terminal, Johor Jaya Bus Terminal and Tun Aminah Bus Terminal. Johor Jaya Bus Terminal and Tun Aminah Bus Terminal are smaller bus terminals within Johor Bahru neighbourhood areas. In addition, there are also departure points from areas such as Merlin Tower Johor, Taman Johor, and KFC Petronas Jalan Skudai. Passengers are advised to check the schedule and departure points before boarding. All coaches will terminate at First World Hotel. Currently, the Genting Highlands outdoor theme park is closed for major renovations to prepare for 2019 opening of new theme park Twentieth Century Fox. Twentieth Century Fox World in Genting Highlands Malaysia will feature around 25 thrill rides and attractions based on films like “Rio,” “Ice Age,” “Life of Pi,” “Planet of the Apes” and “Alien vs. Predator.” The first-ever film-inspired theme park by Twentieth Century Fox at Genting Highlands will be the catalyst to attract thousands of visitors going to Genting Highlands. By the time, the number of passengers taking bus from Johor Bahru to Genting Highlands will surge. Having problems with getting your ticket at a bus counter for bus from Johor Bahru to Genting Highlands? Now you can book your Johor Bahru to Genting Bus Ticket online at BusOnlineTicket.com in a hassle-free style, especially after the opening of Twentieth Century Fox at Genting Highlands. Hassle-free and secure booking environment makes BusOnlineTicket.com to be the most popular online booking portal among the customers throughout these years.